When people ask - as they often do these days - which is the biggest tax haven in the world, our answer is almost invariably the City of London. The City hosts Britain's largest offshore financial centre and is intimately linked to satellite tax havens across most time zones, ranging from Hong Kong and Singapore in the East, to the British Virgin Islands, the Turks & Caicos Islands, Bermuda, the Cayman Islands and the Bahamas in the West. All of these havens are in some respects the Frankenstein creations of the City, as are the Crown Dependency islands (Guernsey, Isle of Man and Jersey) which are easily accessible in less than one hour by jet from London. Often called The Square Mile, the City is a geographically defined area of the London metropolis. 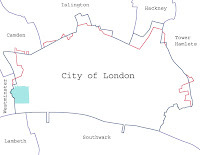 The City is not a London borough, and unbeknownst to almost everybody outside the UK (and to most British people) it has its own distinctive political representative body, the City of London Corporation, which in addition to holding some rather unusual powers - such as the power to organise its own police force - is probably the most powerful and self-interested political lobby in the world. Despite being at the heart of the London metropolitan area, the City has a tiny resident population, estimated at 7,800 in 2006. This is because real estate prices are so astronomical that the City is dominated by office blocks. By day the population swells to around 450,000, almost all directly or indirectly employed by the financial sector. This influx of day-time workers plays a crucial role in shaping the politics of the Corporation, since, unlike every other local authority in the UK, voting rights for the 100 elected members of the Corporation's Court of Common Council are given to both individual residents and businesses, with the latter outnumbering the former. Businesses are allocated votes according to a sliding scale determined by employee numbers, so businesses employing fewer than ten people are allocated one vote, whilst a business employing 3,500 staff can cast 79 votes. "Nowadays, with its Lord Mayor, its Beadles, Sheriffs and Aldermen, its separate police force and its select electorate of freemen and liverymen, the City of London is an anachronism of the worst kind. The Corporation, which runs the City like a one-party mini-state, is an unreconstructed old boys' network whose medievalist pageantry camouflages the very real power and wealth which it holds." John McDonnell MP, an economist who has warned for many years about the dangers inherent in Britain's laissez faire attitude towards banking regulation, describes the Corporation as "a group of hangers-on, who create what is known as the best dining club in the City ... a rotten borough." "There are some indications that the Government has learned not to kill the Golden Goose although it leers at it from time to time." "Tax exemption for foreign dividends is very good news, as is simplified asset management taxation and stamp duty land tax relief for alternative finance investment bonds. Most importantly, I would add to that the welcome review of the controversial taxation of Controlled Foreign Companies laws and the promise of a clear move towards a territorial approach to taxing foreign subsidiaries. This is very welcome as it hopefully marks the end of trying to tax companies worldwide profits, a fact which has been the prime cause of the well publicised exodus of a number of headquarters of UK-based international groups. The Chancellor has the opportunity to create a streamlined, principles based tax regime for foreign profits and to turn the UK into a destination headquarters of choice. We will be encouraging him to do so." And indeed the Lord Mayor and his feudal entourage, plus the cheerleaders of the financial press, and all the king's horses and all the king's men, will never cease in their efforts to encourage the Chancellor to continue to give the City endless tax breaks, not to mention the 'light-touch' regulation which has contributed to the City's status as the big daddy of all tax havens and the largest offshore financial centre. Can things change? Read this new Guardian Article, Labour candidates challenge City bankers' elite that runs Square Mile. "Labour is to fight to break the grip of a bankers' elite controlling the City of London by putting up for the first time a slate of party candidates to run the Corporation of London." A new challenge for the City? Do turkeys vote for Christmas? The likelihood of bankers and financial intermediaries electing representatives capable of achieving even the mildest of reforms, let alone the wholesale changes required to make the City responsive to public interest are close to zero. And the chances of the UK government taking active steps to rein in the City's powers and privileges are also close to zero, since this government and its predecessors, have been almost wholly captive to the interests of financial capitalism. How right Michael Heseltine was when he quipped - in the context of John Smith's efforts to woo the City - that "never have so many crustaceans died in vain." The celebrated Prawn Cocktail Offensive marked the end of the Labour Party and the birth of New Capital. Given the high degree of political party dependence on funding from City interests; given the unhealthy revolving door between front-bench posts and City boardrooms; given the endless barrage of special interest pleadings from "independent" think tanks and financial journalists with close links to City institutions; given the deep-rooted belief that what is good for the City is good for Britain, we can expect to see business as usual for the foreseeable future. Why such a negative conclusion? The (political and financial) times they are a'changing - fast. The #OccupyLFS #OccupyLSX protests are leading the way - aided by the CoE's ridiculous handling of the St Paul's protest. Democrats across the country should be grateful - and start their own local protests, perhaps. Westminster's way behind the political curve, with its (allegedly) representative democratic model. Change can only come from the bottom up through direct participation. As the politico-financial Establishment - aided it seems by the upper ranks of the CoE - hunkers down in fear of that change and of real democracy, people are finding their courage. Democratising the Corporation of London can no longer be avoided. Not only Labour's John McDonnell but London Assembly Green Party member Jenny Jones are calling for its abolition (trust outdated and damaging party-political feuding won't prevent an alliance). Meantime, #LVT land tax and #CitizensIncome (#BI) - two fundamental ingredients of a way forward from #GDPfail - are to be discussed this week at #OccupyLFS. Your complains about tax injustice are clearly correct but you seem to forget an alternative solution, one where we ordinary citizens pay as little tax as the bankers. In fact, you are pretending like paying tax is a good thing rather than the theft that our Government inflicts on us. Another thing, on one hand you could be right that there is too little of the kind of regulation that makes banks more queal to us ordinary citizens. Howver, waiting for that kind of regulation is hopeless and I argue that we should instead REMOVE the regulation that allows banks to do things that we ordinary citizens cannot do, such as central banking by the BOE, fractional reserve banking, subsidies from deposit insurance, rehypothication, etc. All of these and many more are examples where too much regulation gives the bankers a get out of jail free card. We often forget that the free maket has its on regulating forces all of which are undermined by the aforementioned regulatory structures. Thus, everybody must support a total Government withdrawal from supporting banks and limiting ordinary citizens..freedom (including tax freedom) for all.